TDs are to get a €5,000 increase over the next two years. 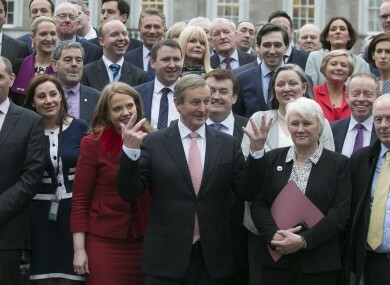 Taoiseach Enda Kenny with all the Fine Gael party elected TDs. TDS VOTED yesterday to give themselves pay hike, despite ministers and junior ministers forfeiting the wage increase. The last-ditch effort by Sinn Féin to halt the pay increase – or pay restoration – for TDs of €5,000 over the next two years was defeated yesterday evening. The pay increase falls under the Haddington Road Agreement for public servants. Sinn Féin put down a motion to stop TDs getting the pay increase. However, the government and Fianna Fáil joined forces to pass a countermotion instead – by 91 to 39. Speaking last night about the motion’s defeat Sinn Féin spokesperson on Public Expenditure and Reform David Cullinane TD said it was “an issue of fairness”. “It is unfair that somebody on €30,000 or €40,000 per year, an average wage in the public sector, is getting pay restoration of €1,000 while deputies are expected to take over €100 a week,” he said. “There’s a real disconnect with what our constituents are voicing, and how this government is proceeding,” said Kathleen Funchion. “This is particularly insulting when set in the context of increased industrial tension in the public sector,” she added. Sinn Féin faced criticisms from other parties that it was merely being populist due to party members drawing down the full TDs pay of €87,258. However, the party states that its TDs only receive the average industrial wage, returning the rest to the party. “It isn’t about what we already get, it is about what the government wants to give back at this point in time,” said Cullinane, who said Sinn Féin TDs won’t be taking the pay rise. Prior to the vote, he said Sinn Féin were not tabling the motion “to put any TDs under pressure”. I say that genuinely. We do see this as an issue fairness. I don’t believe it’s justified. Sinn Féin were not the only ones facing criticism from other TDs. Dublin North West TD Noel Rock spoke out against the wage increase. In doing so, the Fine Gael said he was approached by a TD in the Dáil bar and told he was ruining it for the rest of TDs. However, despite Rock’s previous statements, he did not go so far as supporting the Sinn Féin motion. However, he would not be drawn on what individual TDs should do. I don’t want to start putting individual TDs on the spot. Lots of people have different circumstance they are living in and people should make their own minds up. Email “TDs are definitely getting that pay hike next year ”. Feedback on “TDs are definitely getting that pay hike next year ”.